My friend and I had lunch in the hotel, and like earlier in the weekend there were still people all over the lobby waiting for athletes to come down so they could collect autographs and take pictures. 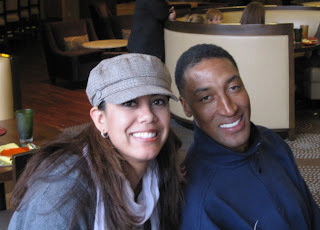 As I waited for my friend to return to the table and our food to come out, I saw Scottie Pippen walking towards me. He was walking with an Asian gentleman, and it looked like they were having a meeting. I was alone at my table, so I knew I could go over and ask Scottie for a picture without making my friend look foolish. However, I began to debate whether I even wanted to go over... See, I've never been a Scottie Pippen fan. I've never been a Chicago Bulls or even a Michael Jordan fan. (Apologies to my friends, who played on the NBA Championship Bulls teams and read this blog.) I respected the team's wins and championships. I respect the talent of Michael Jordan. I began to fear all triangles, because of Phil Jackson's genius. However, I would never call myself a Bulls fan. Scottie Pippen was a great player, BUT I remember the game where he decided to bench himself (i.e. take himself out of the game) when Phil Jackson drew up a play and Tony Kukoc was slated to take the final shot. I cannot forget that moment. I couldn't believe it. What PROFESSIONAL athlete does that?!?! Well, Scottie did. I hate interrupting people who are eating. Lucky for me, Scottie wasn't eating. However, it was obvious he was having a meeting. The waitresses had kept interrupting him, and I began to feel bad for him. But admittedly, I'm a little selfish and I knew my time was limited and I was not going to miss my chance. A good photographer is patient, but if you want to take a picture with a celebrity/athlete you have to be quick and choose your times carefully. I piggy-backed off of a teenage couple and jumped in as they were leaving. It was perfect. In that couple minutes of interaction and after watching Scottie interact with his fans, he may have won me over a little bit as a fan. He appeared sincerely gracious and appreciative of the attention and adoration. Thank you, Scottie for being a class act!